Ada pertanyaan untuk Thanh Binh 2 Hotel? Terletak strategis di Kota Ho Chi Minh, Thanh Binh 2 Hotel adalah tempat yang luar biasa untuk menelusuri kota yang aktif ini. Terletak hanya 4 km dari kehebohan pusat kota, hotel bintang 3 ini memiliki lokasi yang bagus dan menyediakan akses ke obyek wisata terbesar di kota ini. Yang tidak ketinggalan adalah akses mudah dari hotel ini ke sejumlah obyek wisata dan landmark kota ini seperti Benh Vien Chỉnh Hinh Va Phuc Hoi Chuc Nang Tphcm, BenThanh Street Food Market, Thong Nhat Hospital. Di Thanh Binh 2 Hotel, setiap upaya dilakukan untuk membuat tamu merasa nyaman. Dalam hal ini, hotel menyediakan pelayanan dan fasilitas yang terbaik. Para tamu hotel ini dapat menikmati fasilitas di tempat seperti layanan kamar 24 jam, WiFi gratis di semua kamar, satpam 24 jam, layanan taksi, layanan tiket. Akomodasi hotel telah dipilih secara cermat demi kenyamanan maksimal dengan adanya lantai karpet, televisi layar datar, akses internet - WiFi, akses internet WiFi (gratis), kamar bebas asap rokok di beberapa kamar. Hotel ini menawarkan fasilitas fantastis, termasuk sauna, pijat, kamar uap, untuk membantu Anda bersantai setelah sepanjang hari beraktivitas di kota. Ketika Anda mencari penginapan yang nyaman di Kota Ho Chi Minh, jadikanlah Thanh Binh 2 Hotel rumah Anda ketika Anda berlibur. Sesuai dengan hukum yang berlaku, wisatawan asing tidak boleh berbagi kamar dengan warga negara Vietnam tanpa surat nikah sebagai bukti. Nice location. Easy to access. Hotel staffs are courtesous n friendly. The hotel room is clean, aircon is working fine. No complains, and the vip room is big and spacious. 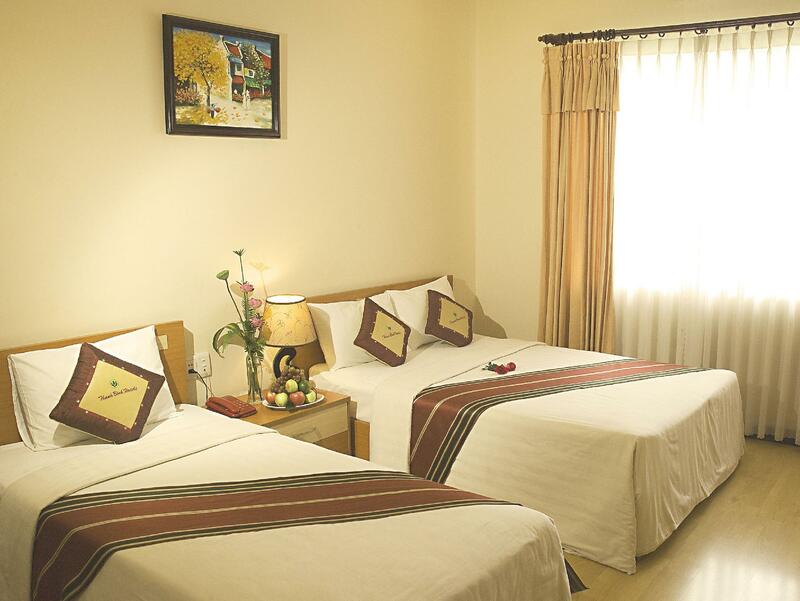 The hotel is located in the middle of a wholesale clothing and fabrics district. There' no nightlife around here but there's a 24 hour massage parlor attached to the hotel. It's looks pretty shady so you traveling businessmen might find some suitable entertainment there. Their largest room, the VIP room is listed as being 35 square meters on Agoda. They initially tried to give me a room which was about 23 square meters. I went back downstairs to ask if they gave me the wrong room. Then they gave me a larger room that was about 32 square meters. Close enough to 35 square meters. Anything 30 square meters or above is plenty of room for a hotel room. I highly recommened that you book the VIP room because it's only a few dollars more and it's so much larger. But if you do, make sure they don't "overlook" it and give you a smaller room. I had a Vietnamese National visit me and the reception informed her that she can go to my room, but will not be allowed to stay the night unless we provide proof or marriage. If you are traveling with a local national, be prepared to hand out some bribes or book a second room. The Agoda site listed the room has having a bathrobe as an amenity, but that's not true. Maybe that are referring to the attached massage parlor. There was no electrical outlet near the desk, so I had to use an extension cord that I brought to plug in my laptop. Bring a 100 foot ethernet cable if the wifi in your room is not sufficient. Room Tip: Get the VIP room, it's 32 square meters and is only a few dollars more. The hotel is not bad but some of the things are broken, they to to upgrade and repair. Like the water is dripping very low in bathroom. Very average hotel, nothing around the area at all, convenient to airport, but there is closer and cheaper if you are overnighting waiting for a flight. Location is near the airport but far away from anything else. However it is easy to access from places to places if you were to rent a scooter and brave the packed streets of HCMC. Otherwise, a cab is also fine. Friendly staff will help with getting a cab. Budget hotel but can do better. 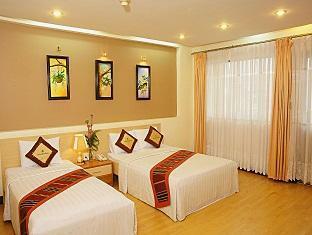 we pick this hotel for last 2 days of my trip in hcm city because close to airport. hotel class three and a haft star !!!. not worth for one and a half star. i ask staff- they said all rooms are like that- just a few room have window but 2 single beds- not for double bed ??? and still not available.lies. bathroom no shower- only bathtub.all taps were rusty.power point is loosed.tv is 1999 model. the people smoke from the other room with open there door makes us sick with smell. hotel restaurant looks big, but so funny !!! we sat there 10'. (only 5 guests include us ) only one girl take order but she was busy.we ask for menu. she said only one menu but the other customer is using.she doesn't know where the menu is kept. we have to go to somewhere else to get dinner.we take taxi to another restaurant about 2.5km because nothing around here. don't stay here if you don't want to get bad experience. My room was opposite a disco but all music stopped at 10pm. The sheets seemed not to be as fresh as I would have liked. The bathtub was a great convenience. Location was the reason I chose this hotel... 10 minutes from the airport. So different to say something about it!!! First, when i arrive the hotel, no person to help me to carry the luggage. Second, maybe it is no breakfast. Third, the location is so remote, distance to the airport is no that close. This advises are mine, so for your reference. 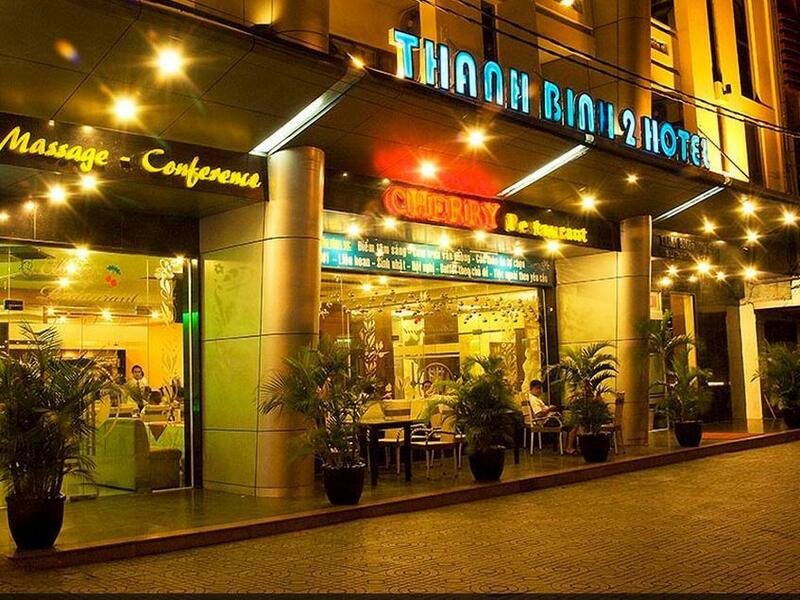 My stay at Thanh Binh 2 Hotel was sufficient. I wanted to stay in that area of HMC and despite the low end neighborhood, the hotel was respectable. Clean room. nice Staff. Ok breakfast. 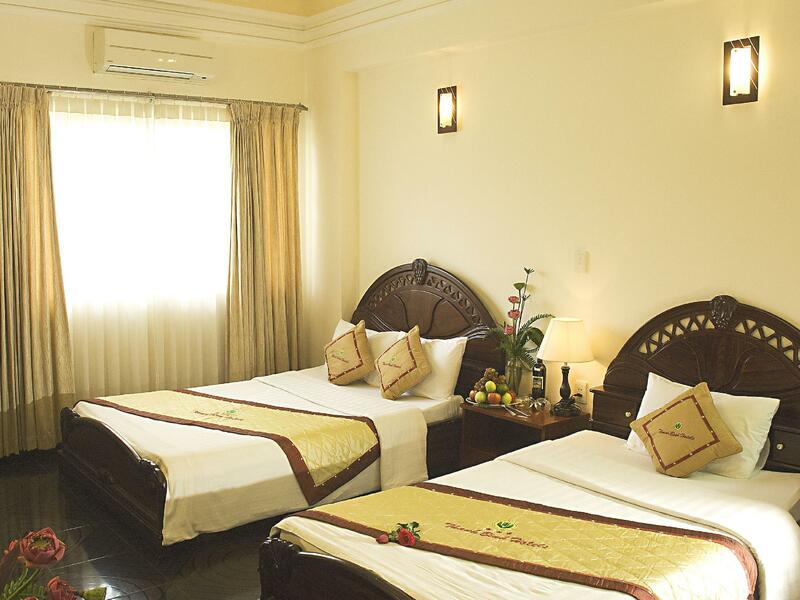 Ok as a first night hotel om your stay in Vietnam. Not comfortable. The facilities does not show that this hotel is worth for 3 star. The price is high.